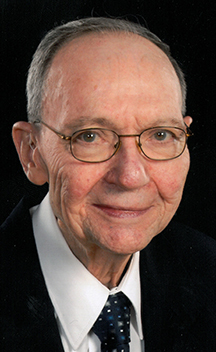 OTTAWA — Joseph K. Schroeder, 86, of Ottawa passed away 5:12 p.m. Friday, April 5, 2019 at his residence. He was born August 27, 1932 in Leipsic to the late Felix F. and Josephine E. (Cooley) Schroeder. On April 27, 1957 he married Irene A. Beining, who survives in Ottawa. Joe is survived by five children: Lisa Melvin of Kettering, Kevin (Pamela) Schroeder of Lima, Ellen (Frank) Catanzariti of Springfield, Fred (Jane) Schroeder of Ottawa and Kristiann Schroeder of Mason; fourteen grandchildren and one great-grandchild. He is preceded in death by a sister, Felicia (Elmer) Dickman. Joe was a 1950 graduate of Campion Jesuit High School in Wisconsin, and a 1954 graduate of the University of Dayton. He was a veteran of the U.S. Army, serving in Korea from 1954 to 1956. He was the first CPA to open an accounting practice in Putnam County, founding Schroeder & Co., CPA's in 1964. He was a former president of the Lima Chapter of the Ohio Society of CPA's; a former president of the Ottawa Area Chamber of Commerce, and a former member of the Ottawa-Glandorf School Board. He was an active member of Sts. Peter and Paul Parish in Ottawa, where he served many years as a lector and as a member of the Finance Committee. He was one of the founding trustees of the Sts. Peter and Paul School Educational Foundation, and an honorary chairman of the current Sts. Peter and Paul School Capital Campaign. The funeral mass will be 10 a.m. Wednesday, April 10, 2019 at Sts. Peter and Paul Catholic Church, Ottawa with Father Matt Jozefiak officiating. Burial will follow in the church cemetery. Visitation will be from 2 to 8 p.m. Tuesday at Love Funeral Home, Ottawa where a scripture service will be held at 7:50 p.m.
Memorial contributions may be made to Sts. Peter and Paul School Capital Campaign. Online condolences may be expressed at www.lovefunerlhome.com.